The KTM 390 Duke is a special motorcycle for the Indian market. Since its launch here in 2013, the motorcycle has gained a lot of popularity because of its extreme looks and high-performance engine. In the 3 years since, the motorcycle hardly received any major update. All that’s going to change. At the recent EICMA show of 2017, KTM unveiled the all-new Duke 390, and here are 10 things that you did not know about the 390 Duke, coming soon to India. The 1290 SuperDuke is an insane looking set of wheels. It is also the flagship naked motorcycle carrying the KTM brand on it. The 2017 390 Duke now looks like a true sibling to the SuperDuke. It gets vertically partitioned headlamp with an angular housing. The headlamps are all-LED. The new 390 Duke also gets new tank extensions that make the motorcycle look much more muscular. 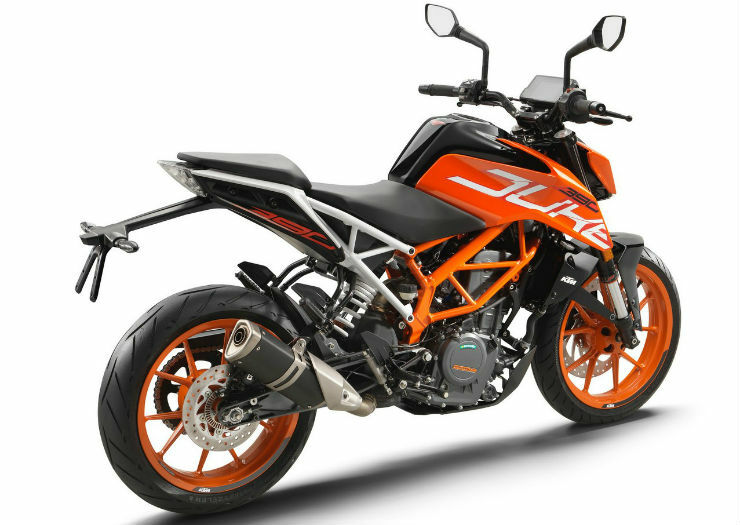 The exhaust design of the 390 Duke shows up on the side of the motorcycle like the 1290 SuperDuke. The high-mounted LED turn indicators are also inspired by the flagship model. 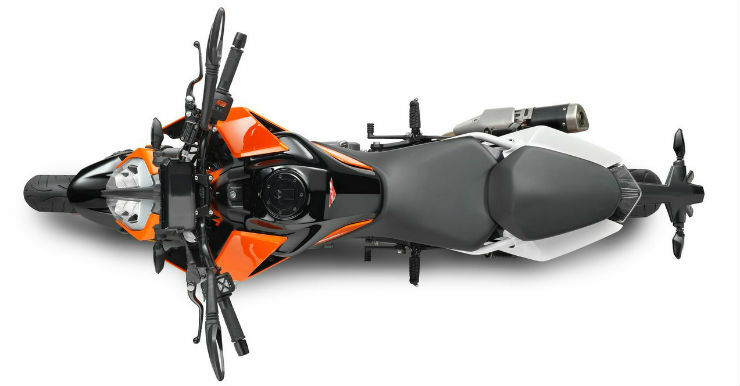 The current version of the 390 Duke has underbelly exhaust. Side by side, the 1290 SuperDuke and the 390 Duke look like brothers. The 2017 Duke gets steel fuel tank unlike the current plastic tank. Even so, KTM says that the new tank does not add to the overall weight of the motorcycle. The tank has also increased in the size to help the touring fanatics. The tank now holds 13.4-litre of fuel unlike the 11-litre fuel in the current model. It will be a tourer’s joy to push in the extra fuel that is always helpful during long journeys. With the stringent emission norms gripping the manufacturers around the world, KTM announced that the new 390 Duke will get a bigger catalytic converter. The new part in the motorcycle will be able to take on the exhaust gases more efficiently. KTM announced that the new motorcycle will be Euro IV/BS IV complaint, which means smaller carbon footprint every time you take a ride. A part of the 390 Duke’s looks comes from the bare parts of the chassis that is exposed for the onlookers. KTM has put an all-new frame and sub-frame on the new Duke. The new 390 Duke becomes more agile with the new frame and according to KTM, the new Duke is more stable around the corners when compared with the current generation of the motorcycle. The KTM Duke 390 gets more stopping power with the bigger front disc brake. The disc becomes larger by 20 mm with a total diameter of 320 mm. The disc brakes gets Brembo developed ByBre callipers and also come with standard ABS. The larger brakes will surely make the riders feel more comfortable when bringing the motorcycle to stop from high-speed ventures. The fun fact is ABS can be disengaged. KTM has put an all-new TFT screen replacing the old small console. The new TFT is much bigger and can be read out much more clearly. The TFT screen gets a blue backlit and easy access to the settings and other important data in the motorcycle. The TFT screen comes with MyRide interface that is optional. The MyRide interface can connect to you phone via Bluetooth and can show you the important information like the name of the caller or new text message notification. With this feature, you would not miss an important call again in your life while riding a motorcycle. Earlier this year, KTM launched the fully faired version of the 390 Duke – the RC390 with ride-by-wire technology. 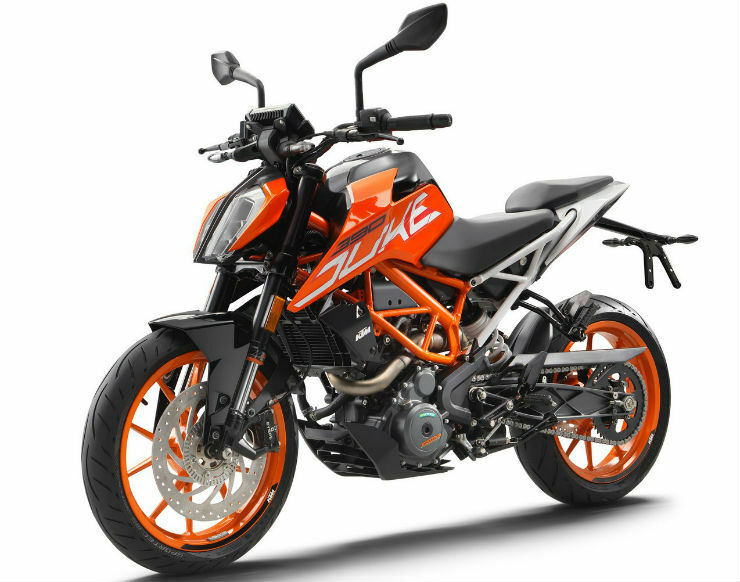 Now the KTM 390 Duke also gets the same. The ride-by-wire technology gives various control to the motorcycle like variable power modes, cruise control, traction control and much more. The new 390 Duke with ride-by-wire technology offers only better fuel economy and smoother acceleration. The current KTM 390 Duke comes with chunky 43 mm Upside Down WP suspension. The new one gets even better ride quality with an open cartridge upside down 48 mm WP telescopic front forks. The set-up will result in much more smoother ride and better handling during high-speed corners. The new 390 Duke will also take birth in India at the Bajaj manufacturing plant in Chakan. As per KTM, The cleaner engine and the new features will surely make the Duke 390 little more expensive than the current version but it should be worth the extra price. Keep looking for the space as we bring in more updates as the launch happens on 23rd February.